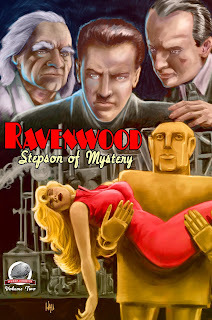 Airships 27 Productions is thrilled to announce the release of their latest title, RAVENWOOD – STEPSON OF MYSTERY Vol II. Easily one of the most obscure classic pulp heroes of the 1930s was Ravenwood - Stepson of Mystery. In all he appeared in only five stories, these as back up tales in issues of Secret Agent X. 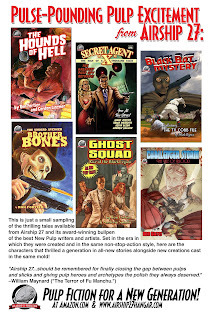 Several years ago Airship 27 Productions released its first volume in this series bringing back this unique occult detective, whose different colored eyes are always changing. The stories also feature his Tibetan teacher/mentor, the Nameless One, and his loyal British butler, Stirling. Now get ready for another quartet of brand new tales of suspense and action as the Stepson of Mystery once again sets out to solve bizarre mysteries the police are helpless to unravel. Follow along as he confronts an amazing killer robot, teams up with the Black Bat to fight an alien horror and investigates ritualistic murders that have no rhyme or reason. 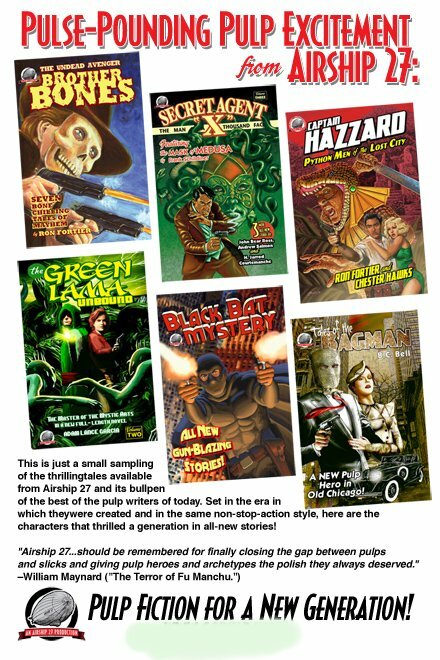 New pulp writers Janet Harriett, Aaron Smith, Jonathan Fisher and Gene Moyers pull out all the stops, delivering four original, fast paced adventures that skirt the outer edges of fear and madness. This is one pulp book best read with the lights on! This second volume in the RAVENWOOD – STEPSON OF MYSTERY series, features a cover produced by Rob Davis (pencil composition) and Shannon Hall (digital colors) with twelve stark interior illustrations by Eric York. 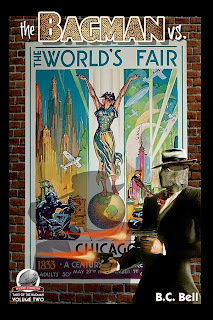 “If you’ve never read a Ravenwood adventure before,” Fortier continues, “this is a good place to jump on board.” He also added that there is a full length RAVENWOOD – STEPSON OF MYSTERY novel now in the works and should be available soon. Available Now at Amazon.com & on Kindle! 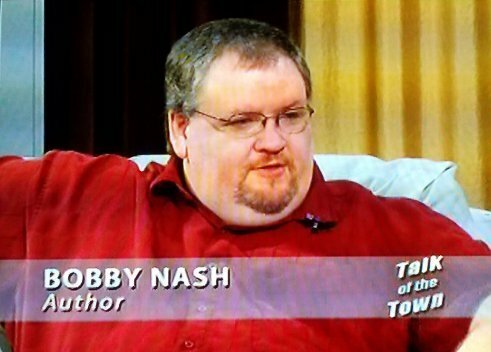 New Pulp Author Bobby Nash was interviewed on Talk of The Town, a local interview show filmed in his community. 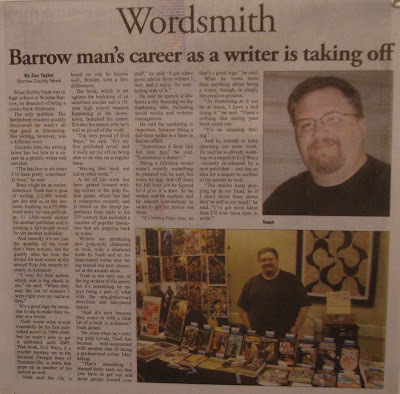 Over the course of the twelve and a half minute interview, the show's host, Karen Allen talked with Bobby about writing, pulp, Evil Ways, Lance Star: Sky Ranger, The Ruby Files, and his latest release, Fight Card: Barefoot Bones. The video has now been posted to the internet. You can watch it above or here. 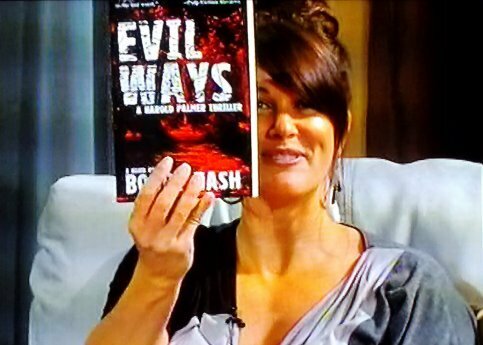 Bobby is the second interview, following author Creston Mapes, starting around the 12 minute mark. 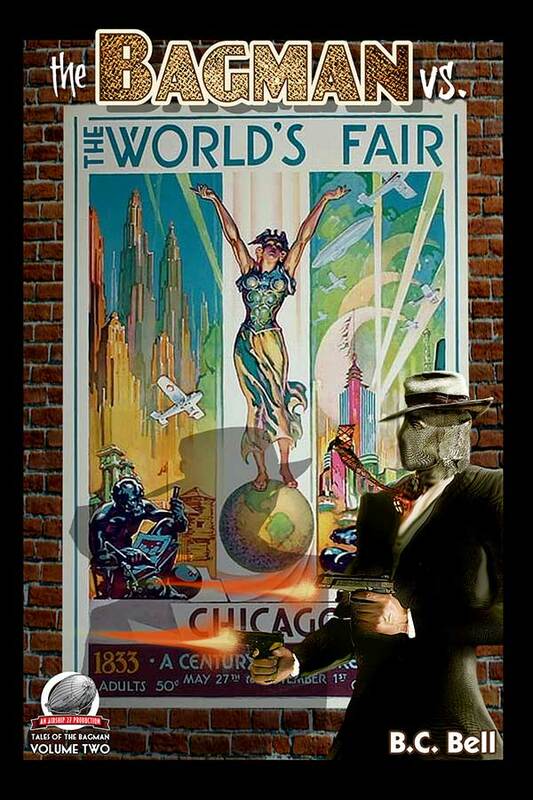 Airship 27 Productions is delighted to announce the release of its latest pulp title, THE BAGMAN vs THE WORLD’S FAIR by B.C. Bell. So slap another clip in your .45, straighten your tie and put that bag over your head, pulp fans; here comes the Bagman, delivering justice in his own peculiar way. Available now from Amazon & on Kindle. 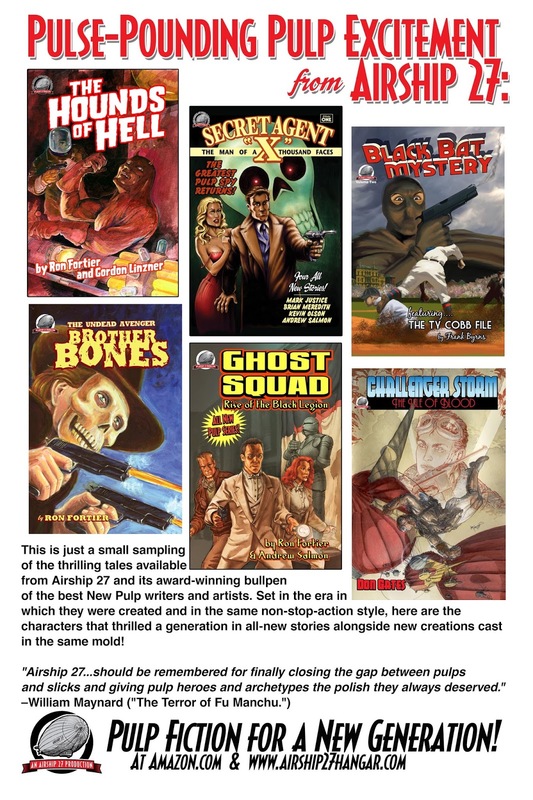 Did you know that your local bookstore(s) can carry Airship 27 titles on their shelves? ( http://robmdavis.com/Airship27Hangar/airship27hangar.html) of our on-line Airship 27 bookstore to the merchant. They can choose as few or as many titles to order as they wish at a special, non-returnable, bookstore discount! Step two: After they choose the titles they want and the number of copies of each title, ask your bookstore to place their order with Rob Davis at robmdavis@me.com. In fact, the easiest second step might be just to print off this e-blast with the addresses for your bookstore!! 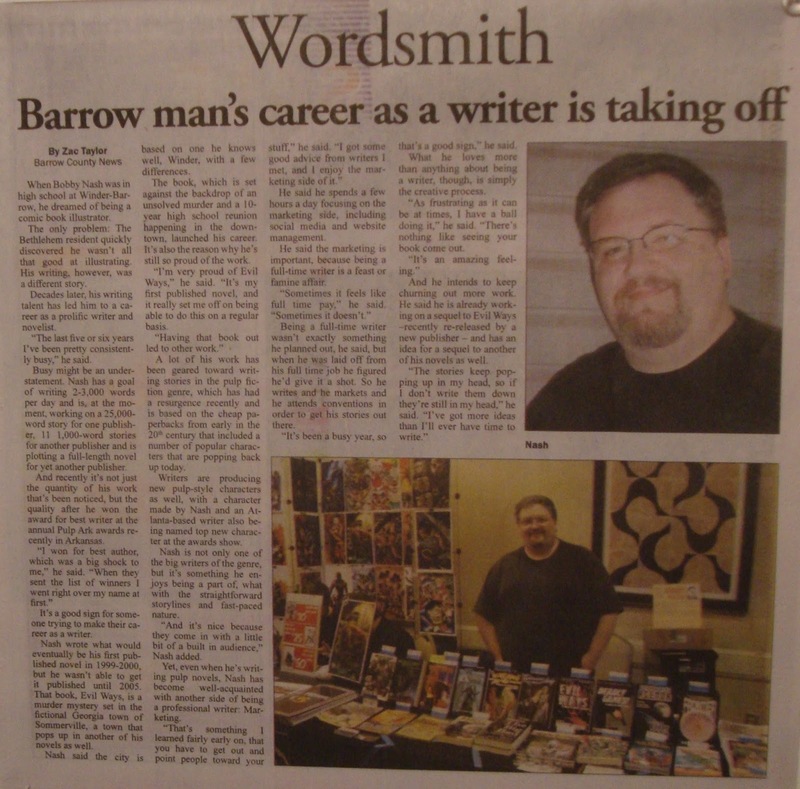 The Pulp Factory's Bobby Nash was interviewed for his local county newspaper, The Barrow County News, back on July 10th. Click on the image above for a larger, readable view. Pull up anchor, cast off the mooring lines and drop the sail, the good ship Blue Nymph is about to set sail for adventure once again with her famous seafaring captain at the helm. Airship 27 Productions is thrilled to present the second volume of brand new stories starring the greatest seaman of them all, Sinbad the Sailor and his international crew of daring adventures. Here are the Henri Delacrois, the deadly archer from Gaul, Ralf Gunarson, the strapping young Viking giant, Tishimi Osara the beautiful female samurai and of course Omar, the irascible first mate. All of them bound together by their love of action and yearning to explore uncharted lands. This volume contains a new novella by Ed Erdelac with short stories by Shelby Vick and Erwin K. Roberts. Capturing the feel of the old cinematic hero developed by the late Ray Harryhausen, the volume features illustrations by Steven Wilcox and a cover by Kevin Johnson with designs by Rob Davis. Over the horizon awaits treasure, beautiful exotic maidens and monsters beyond imagining. 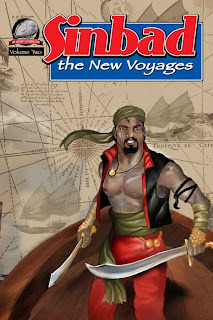 Dare you sign aboard with Sinbad El Ari? If so, then battened hatches and have your curved blade ready, heart pounding adventure awaits within these pages. Available from Amazon.com in both hard copy and digitally for Kindle.